Figure 0.1 Source: Adapted by the author from Trudy E. Bell, “Space Activists on Rise,” Insight (National Space Institute), August/September 1980, 1, 3, 10 and Trudy E. Bell, “From Little Acorns…American Space Interest Groups, 1980-1982,” unpublished paper. Material provided by NASA and Trudy E. Bell. As I sit at my office desk my mind sometimes wanders. I find myself looking out through the window at the flat Texas countryside stretching, seemingly forever, across the Gulf Coast toward the bustling city of Houston visible on the horizon. Were it not for this distant city and the traffic I see off to the far left, the landscape of rough grass and Texas scrub could easily be from the Wild West of the past century. But then my thoughts come back to the present and my eyes move away from the window to the model of the white Space Shuttle Orbiter poised in perpetual landing six inches above the desk, to the miniature replica of a communication satellite, to the chunk of charred heat shield suspended inside a ponderous transparent paperweight, and then to the assortment of space photos — launches, landings, and earthscapes mounted in frames around the walls — and I find myself astonished, even again, by all of this. The time cannot be the past century. We are living in the Space Age. The newspaper on my desk today displays a headline, “Voyager Finds Two More Uranian Moons.” Even as I write this paragraph, the Voyager spacecraft, eight years into its journey, is encountering Uranus, the seventh planet out from the Sun. Voyager is 2 billion miles away from us and yet communicates back in wonderful detail the secrets of this enormous planet. Perhaps I am still astonished by this because I did not grow up in the Space Age, nor did I dream as a youngster of being a space worker. In those days there were no such things as astronauts, launch directors, space suit technicians, or space workers of any kind. The only satellite that orbited the Earth was one we called the Moon. If I dreamed then about “reaching for the high frontier,” I might have been imagining myself as homesteading a plateau nestled in the Rocky Mountains, a place that sounded like a frontier and certainly was higher than the bluffs of the Wabash River near my home. But such dreams had nothing to do with space, and, indeed, I was in college before Sputnik made its first orbits around the Earth. Now it is hard to believe that only three decades have passed and in these years our space workers have orbited Earth, walked on the Moon, and lived in zero gravity for months at a time. In addition, we have sent our robots, spaceships which in a way are extensions of ourselves, to land on, or orbit around, or fly past every planet in our solar system but one. Some say that out of all the generations that have preceded us on planet Earth we will be the last to live exclusively on its surface, that our children and grandchildren, some of them at least, will live elsewhere. In fact, the National Commission on Space now urges this nation to begin construction of the ultimate railroad — a space transportation system with lines to low Earth orbit, to geosynchronous Earth orbit, to the Moon, and to Mars and beyond. What just 30 years ago would have been wildly impossible is today not only possible but is even being recommended as appropriate to undertake. We are all privileged to be front-row center to these space expeditions, to watch and, to some degree, to participate in history as it is being written. But history is more than just events, it is people being motivated by convictions, beliefs, enthusiasm, and, in some cases, the sheer audacity to cause historic events. Reaching for the High Frontier is about such people. Editor’s Note: This foreword was written and mailed just before the tragic explosion of the Space Shuttle Challenger on January 28, 1986. Dr. Allen, a former Shuttle astronaut himself, was deeply moved by this event. However, he believes that the theme of his foreword should remain unchanged. When I was a boy, humans had not yet ventured into space. But I, and many others, knew that spaceflight was just around the corner. The 1950 film Destination Moon stirred our imaginations. By the early 1950s, the writings of spaceflight advocates such as Wernher von Braun, Arthur C. Clarke, and Willy Ley were spreading ideas about the excitement and promise of space . Growing up in California, I was very much aware of the brave men at nearby Edwards Air Force Base, who were pushing needle-nosed aircraft through the sound barrier. By the late 1950s, pilots of the X-15 were riding that half-rocket, half-plane higher and higher into the sky, probing the edge of space. Something of historic importance was happening — something in which I believed I should be involved as more than a spectator. But how? There was no obvious means for a person without technical qualifications. Since the last Apollo flight to the Moon in December 1972, I have been following the story of ordinary Americans, mostly of younger generations, who did get involved with the spaceflight dream. They tried to speed its coming as a real experience, not just for the few, but for the many. Some of these people have devoted vast amounts of their time, energy, and, in some cases, money to seeing the dream come true, even when they received no direct economic or professional return. As space activist David C. Webb once commented to me, “These people deserve a footnote in history” . set of ideas and aspirations, mixing idealism and pragmatism in modern, American ways. 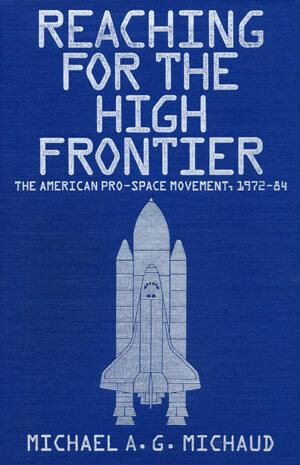 In this book I attempt to do two things: (1) to provide an informal, capsule history of the pro-space “movement” in the United States from 1972 through 1984 and (2) to present a simple analysis of American pro-space groups as an interest group phenomenon. I focus on the organized part of the pro-space phenomenon, the visible tip of the interest iceberg. I argue that pro-space activity in the United States has come a long way since the end of the Moon race. Something new has been added to the first rush of diffuse enthusiasm and the more prosaic concern for economic and professional advantage. A new generation of space advocates has emerged, convinced that space holds answers to such real-world problems as economic growth, environmental degradation, international tension and the threat of nuclear war, and the need for a hopeful future. Many of these people aspire to go into space themselves. By the early 1980s, the groups they had formed were showing increasing political sophistication and entrepreneurship as they pursued both direct and indirect approaches to expanding human activity in space. They were supported, if passively, by a growing pro-space constituency. The things they were doing interacted with trends that seemed to converge in the early 1980s: regular access to space through the Space Shuttle, space commercialization, heightened interest in space defense, a decision to build a space station, and revived confidence in the future of the United States. The period January 1972 to January 1984 provides a useful frame. In 1972, the last Apollo mission to the Moon marked the end of the first, adventurous era of U.S. spaceflight. But that year also was a beginning. In January 1972, the Nixon administration announced a decision to build a Space Shuttle, the enabling vehicle for a new era of U.S. space activity. Twelve years later, with the Shuttle performing superbly, the Reagan administration announced a decision to build a permanently manned space station, the beginning of what I call “the Second Spaceflight Revolution.” The years 1972 and 1984 also mark crucial turning points in the history of space-based ballistic missile defenses. In 1972, the United States and the Soviet Union signed a treaty banning space-based antiballistic missile systems. In January 1984, the Reagan administration formally set in motion the Strategic Defense Initiative, a research program that might lead to space-based defenses. Those end-pieces, those punctuation marks in time, bound an era in space advocacy, during which more Americans accepted broader uses of space, incorporating it into the U.S. cultural and intellectual heritage. My first priority has been to tell a story. Bits and pieces of it have appeared in magazine articles and in papers presented at conferences. Science writer Trudy E. Bell has been doing biennial surveys of pro-space groups since 1980 . But no one, to my knowledge, has pulled the story together in a book. I believe it to be an interesting story, about highly motivated people striving to see their dreams become reality and meeting frustration in their encounters with the hard, unsympathetic world of politics and budgets. Most people do not get involved in politics or lobbying unless their interests are threatened. In the case of the pro-space phenomenon, what was threatened was not so much pragmatic interests as it was a vision of the future. In this book I also have something to say about how ideas become interests, and how those interests are advanced and defended by people who are new at the game of interest group politics and lobbying. The story reminds us that most big technological ideas have longer tails than we think and are made acceptable only over a period of time, through repeated advocacy that makes them familiar and technological advances that make them more credible. Members of pro-space groups that emerged after 1972 generally were rather naive about how to get things done in Washington, D.C. The learning process they went through illustrates changes in the world of interest group politics and suggests some limits to what lobbying can do. The achievements of pro-space activity are also discussed in this book. How effective have the new pro-space activists been? Have they had any significant effect on policy, legislation, programs, and attitudes? Will their dreams become reality? This is an eclectic book, more a survey than a thorough analysis. I could have tried to make it a more scholarly work of history, political science, or sociology, but such a book might have interested only a handful of specialists. Instead, I have sought to reach a broader audience, including those interested in space as well as those fascinated by U.S. social and political phenomena. I have avoided technical language and social science jargon, trying to make the pro-space adventure accessible to laypeople without specialized knowledge, and to emphasize readability over exactness in social science. If this “popularization” has introduced imprecision in terminology or analysis, I apologize to my more scholarly readers. Whatever its failings may be as a work of social science, the book may provide useful raw material for professionals in those fields. Space history is becoming a legitimate field, thanks to the efforts of scholars such as Eugene M. Emme, Walter A. McDougall, and John M. Logsdon. When Joseph J. Corn wrote about a similar phenomenon in The Winged Gospel , he had the good sense to write a generation after the events under discussion. Perhaps someone will come along 20 years from now to do a better study of the pro-space phenomenon during this period. But this is a start. The book may also be a useful reference for pro-space people and their organizations. Some general definitions are in order, particularly for those who are not familiar with the space world. Some of the terms used in this book, such as the space movement, pro-space, and even the term space itself, are convenient shorthand rather than precise social science terminology. To a space enthusiast, space is not just a place, but an umbrella concept for a whole set of ideas, technologies, activities, and aspirations having to do with the exploration and utilization of that larger environment in which our planet floats, and with the often unstated hope of journeying outward to have new experiences, open up new possibilities, and escape the limitations and frustrations of life on Earth. It arches over an amazing variety of interests, political views, and personalities. To be pro-space means somewhat different things to different people. It can refer to their support for larger and better government space programs; to a desire to see more activity by individuals, companies, nations, and the human species in the extraterrestrial realm; to a belief that the intelligent use of space offers solutions to national and world problems; or to a philosophical, even emotional conviction that human expansion into space is a natural and desirable next step in the evolution of life on Earth. What about the space movement? One of my tasks in this book is to examine whether there really is such a thing. Is there a social movement in the United States that supports increased activity in space? Is it coherent enough and large enough to be called a social movement? Whether the reader agrees with my conclusion or not, it is difficult to deny that we have seen a new social phenomenon in this country since the mid-1970s, an upsurge in pro-space opinion and a proliferation of pro-space organizations. One must give this phenomenon a name to make it comprehensible to the general reader, and space movement has proved both convenient and partly accurate. In using the term citizens group, I am drawing a distinction between those organizations whose members generally do not have economic or job-related interests in space and those space-related interest groups with tangible interests in the space field, such as industry, professional, and labor organizations. Pro-space citizens groups, of course, are part of a broader phenomenon of citizen activism that became highly visible in U.S. political life in the 1970s. When I use the term manned in connection with future space activities, I of course include women. “Humaned” and “crewed” sound peculiar, “piloted” is not accurate for space stations and Moon bases. An apology to those who have been left out. I am well aware that individual executive branch officials, members of Congress, congressional staffers, aerospace executives and engineers, and space scientists have made important contributions to the pro-space effort. In most cases, however, those contributions were related in some way to their professions. They were doing their jobs, although often in an imaginative way. What is more interesting to me, and I hope to the reader, are the volunteers and enthusiasts who comprise the bulk of the pro-space movement, and who work with little prospect of reward. They are a cleaner test of the motivations that underlie the pro-space phenomenon. Even in their case, I have left out many deserving people (and many good stories) to keep the book within the limitations of length imposed by my publisher. The same applies to many space interest groups not included here. I realize that some of the smaller groups have been left out. Instead of being comprehensive, I have tried to pick good examples that make the point. Even those included have been treated rather superficially. The research on which this book is based was done by a variety of familiar techniques. A large number of publications, particularly those of the space interest groups themselves, were studied over a period of years. Group representatives and other space activists were observed at a variety of meetings, conventions, and congressional hearings. Statistical data concerning space interest groups were drawn on when available. A few knowledgeable academics (there are not many in this field) were asked for their thoughts. Since there is little written history on this subject, I often have referred to interviews . Oral histories are inherently treacherous, since they depend on human memories that are both fallible and selective. I can only state that I have tried to be objective and fair and to present more than one view in cases of disagreement. Special thanks also go to Michael Fulda, who kindly provided me with his files on efforts to organize the space constituency during the John Anderson presidential campaign in 1980, and to Leigh Ratiner, who allowed me to study the files of the Space Coalition. Marilyn Ehrlich, Alison Podel, and William Day, my editors at Praeger, were patient with missed deadlines and got, I hope, a better book as a result. No one deserves appreciation more than my wife Grace and my children Jon, Cassandra, Jason, and Joshua, who tolerated my absence at night and on weekends and who put up with a clacking typewriter at strange hours. Arthur C. Clarke, The Promise of Space (New York: Harper & Row, 1968), p. 314. Carl Sagan, The Cosmic Connection: An Extraterrestrial Perspective (New York: Dell, 1975), p. 227. Space Industrialization — Final Paper (Los Angeles: Rockwell International Space Division, April 1978), p. 20. Frederick J. Turner, “The Significance of the Frontier in American History,” in Annual Report of the American Historical Association for the Year 1893 (Washington, D.C.: U.S. Government Printing Office, 1894), pp. 197-227, 227. Jerry E. Pournelle, as quoted by the L-5 Society in its announcement of the Third Annual Conference on Space Development, held in April 1984. Sir Herman Bondi, in his review of Geoffrey Pardoe, The Future for Space Technology, in Space Policy 1 (February 1985):96. See Wernher von Braun (with J. Kaplan et al. ), Across the Space Frontier, ed. C. Ryan (New York: Viking Press, 195); Arthur C. Clarke, The Exploration of Space (New York: Harper & Brothers, 1951); Willy Ley (with paintings by Chesley Bonestell), The Conquest of Space (New York: Viking Press, 1949). Interview with David C. Webb, October 13, 1983, in “Pro-Space: Interviews with the Space Advocacy,” unpublished manuscript (see note 7). See, among others, William S. Bainbridge, The Spaceflight Revolution (New York: John Wiley & Sons, 1976) and Frank H. Winter, Prelude to the Space Age: The Rocket Societies, 1924-1940 (Washington, D.C.: Smithsonian Institute Press, 1983). For the 1980 survey, see Trudy E. Bell, “American Space-Interest Groups,” Star and Sky 3 (September 1980):53-60. A revised version appeared as “Space Activism,” Omni 3 (February 1981):50-54, 90-94. Bell’s 1982 survey, entitled “From Little Acorns…: American Space Interest Groups, 1980-1982,” was to have been published in volume 2 of The Space Humanization Series (published by the Institute for the Social Science Study of Space), which had not appeared as of early 1986. Results of her 1984 survey appeared in Upward: Status Report and Directory of the American Space Interest Movement, 1984-1985, published in 1985 and available for $20 from the author at 11 Riverside Drive, #13GW, New York, NY 10023. Joseph J. Corn, The Winged Gospel: America’s Romance with Aviation, 1900-1950 (New York: Oxford University Press, 1983). Edited versions of these interviews are in an unpublished manuscript entitled “Pro-Space: Interviews with the Space Advocacy.” That project was supported by a grant from the Una Chapman Cox Foundation. Unless otherwise indicated, all interviews referred to in the notes to this book are in this manuscript.